A Diamond is not just a girls’ best friend anymore. 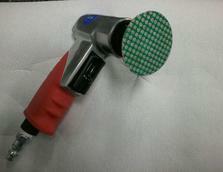 Simms Abrasives has an engineered diamond that can do more than glitter! Our diamond works on the following substances: ceramic, marble, glass, stone, fiber glass, carbon graphite, and the list go's on. 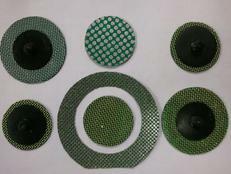 Simms Abrasives produces diamond plated pads of different thicknesses and patterns. The patterns include those with large, medium and small dots along with honey comb. If a customer can imagine a pattern, our company can create it. Diamond Pads can be cut into any shape desired with the use of tin snips. Pictured above is our diamond disc with a spin-on-arbor attached to a rotary tool. This is just one example of how you can use our product. The wire mess back disc Simms Abrasives makes differ from other discs on the market because we find it helps cool the disc as used and increases the life of the diamond, not all will needed the higher end disc, we also have cloth backed as well. Please look at our picture gallery for ideas, the price we charge for our diamond plated pads you can make just about any tool you use into a diamond tool. Cut a strip of the Diamond Pad and glue it an old steel file to becomes a new diamond file, just one idea of many. If you purchase any product with a useful new idea in mind a don't mind sharing please leave a note for other customers. We know the products we make work because of the feedback from customers like you. Give us a call and chat with us. A better price doesn't mean lower quality. High quality discs and pads are made in the USA and can be engineered to your needs using industrial synthetic diamond or natural diamond.